5 Shocking Statistics About Debt. When we talk about the economy and our finances, most of us check in on a number of key statistics, including unemployment rates, the Dow Jones stock market average, and even mortgage interest rates. However, the numbers we should be paying attention to on a macro scale paint a far gloomier picture of the U.S. economy and our finances. In fact, U.S. consumer debt is at an all-time high, surpassing even the salad days before 2008 when the housing market was lava-hot, leading to a run on mortgage borrowing, lending, and spending. In this ongoing series, we’ll delve into the true status and nature of debt in relation to the average U.S. consumer. 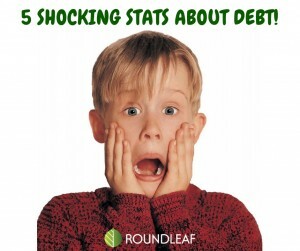 Today, I wanted to highlight just five shocking statistics about debt to get started. As always, contact Roundleaf Inc. if you’re overwhelmed with revolving debt and looking for relief and a way out without filing bankruptcy! At least 8 out of 10 U.S. households are in debt. According to a report by the Pew Charitable Trust, at least 80% of all U.S. households hold some sort of debt balance these days. That includes plenty of homeowners, of course, which is considered “good debt.” However, at least 30% of households (almost one in three) also carry credit card balances, 21% have student loans, and more Americans than ever before are seriously burdened with auto loans. In total, the average household is indebted to the tune of $67,900! Our consumer debt has hit an all-time high of nearly $14 trillion. Add up our mortgages, credit cards, student loans, car loans, personal loans, payday loans, and other lines of credit, and we now owe about $14 trillion – an all-time high. That’s more than the Gross Domestic Product of China! Yes, we owe more PERSONAL debt as consumers than the entire GDP of the world’s second-largest economy! The average household owes HOW MUCH in credit card debt?! If we just look at the U.S households who do have credit card balances, we see that the average per-household debt is a whopping $16,091! Even if we factor in all of the households that have NO credit card debt, the average PERSON in the U.S. has more than $5,437 in credit card debt. By the way, all of that revolving debt – mostly made up of credit cards – is now at $1.03 trillion! We have FAR more debt than savings. Not only is the sheer magnitude of our credit card debt burying us (especially since we’re usually only making minimum payments – which we’ll talk about in a future blog), but servicing all of that debt every month is seriously eroding our wealth. In fact, the average American now has far more debt than they do balances in their savings, checking, or other bank accounts. Studies show that keep an emergency savings fund is vital for financial stability and wellbeing, but about half of all Americans couldn’t even come up with $400 today in case of an emergency without selling something, borrowing, or taking on more harmful debt! Even worse, we’re seriously delinquent on $412 billion of our debt! I documented earlier how we are $14 trillion in debt. But, to be fair, that statistic may not be as catastrophic as it sounds because about $10 trillion of our total consumer debt is in the form of home loans, which are largely positive and attached to tangible assets. However, a more telling – and alarming – statistic is the fact that Americans now hold $412 billion of debt that’s seriously delinquent, defined by at least 90 days late (not just a missed payment or even two). And that’s just the figure reported by the Federal Reserve Bank, and there may be far more retailers, lenders, and alternative loan sources that aren’t reporting delinquent loans to the Fed bank, driving that number higher in reality. Take out the criteria of SERIOUSLY delinquent and just look at 30-days past-due loans, and we have missed payments on $607 billion of debt – or more than 5% of ALL U.S. consumer debt! Do you have $20,000, $40,000, or even $70,000 in credit cards and revolving debt and can’t see a way out? Roundleaf Inc. is the nation’s leader in debt negotiations and settlements.